Over twenty years ago the Documentation Centre on the history of Luccan emigration was set up in the Association headquarters. The Centre is now named after Prof. David Rovai, who supervised its institution and development until his untimely death. 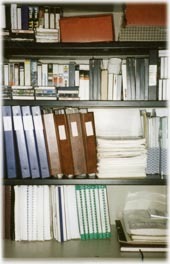 The Documentation Centre's heritage of archives and books has been re-organized and computerised in recent years, with the creation of databanks to make the material collected in the various holdings accessible. The library consists of 1000 volumes, mostly on the subject of Luccan and Italian emigration, some of which in foreign languages. In addition, numerous theses concerning emigration in the province of Lucca and throughout Italy, some of which date back to the nineteenth century, are preserved in the library. The Centre houses a collection of over 80 newspapers for a total of 3000 items, a holding that is continuously on the increase. The most characteristic items are periodicals edited by the numerous headquarters of the Lucchesi nel Mondo Associations (to name but two, Clubhouse, Lucchesi nel Mondo Bruxelles, etc.) and one edited by the Central Headquarters of Lucchesi nel Mondo. There are also collections of journals covering local situations in the province of Lucca (La Garfagna, Il Ponte del diavolo, La Piazza, La Pania, ecc.) and others edited by local authorities. The Documentation Centre houses an almost complete collection of "Il Messaggero di Lucca", a detailed account of social, cultural, political and economic reality in the province of Lucca from 1952 to 1987, circulated abroad through this periodical which mainly addressed Luccan emigrants in the world. The Documentation Centre also holds the archive of the editorial office of this journal - some 5800 files, one for each subscriber. They contain the subscription card with personal data, personal and administrative correspondence between the reader and the editorial office, and the articles published and in some way related to the name on the file. Recently, the family of Nilo Mazzanti, an accountant who for years was secretary of Lucca Chamber of Commerce and right from its institution responsible, for the Chamber of Commerce, for the annual award conferred to Luccans who have honoured Italy in the World, donated the documents in his personal archive to the Association. This section comprises biographical files concerning the Award itself, and a well-stocked section of books, documents and photographs on the history of Luccan emigration, carefully collected by Mazzanti during his many years of activity. In addition, all the material concerning the competition, which has been held since 1971, donated by the Chamber of Commerce to the association. A collection of around 1300 dossiers on the migratory experience, life, studies, working activities, interests and the skills of award-winners abroad. The holding consists of around 7000 items, dating from the 'sixties to the present day. They are divided into two main categories: one dedicated to the activities of the Association's general headquarters, the other to the activities of headquarters abroad. A good number of historically important documents are preserved at the Centre, including emigrants' passports, some of which date back to the XIX century, travel documents, historical photographs, various documents. In the documentary archive, there are files containing collections of journalistic material on the subject of emigration or the Association, collections of literary and poetic works, biographical dossiers, etc. Also in this section is the Caredio Holding, containing documents regarding construction of the carriageable road in the Controneria, built, under the management of Dr. Caredio, also thanks to remittances made by the emigrants.